We spent the last weekend running back and forth up and down I-5 celebrating graduation ceremonies. Thursday night it was up to Lynden for Bria and Marika's Lynden Academy graduation. Friday morning it was down to Seattle for Markus' Ivy cutting ceremony in Tiffany Loop. Then it was back up to Lynden Friday night for Marika's Lynden High School graduation. Saturday was a lay low in the sun day in Lynden. 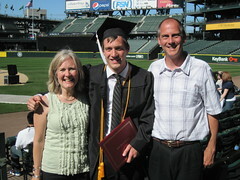 Then on Sunday it was back down to Seattle and Safeco field for Markus' SPU graduation. If things weren't hectic enough, my dear wife locked the keys in the van on Capital Hill one hour before grad time at Safeco. Since Ada's car seat was in the van, Bjorn had to walk her down to Safeco. After the ceremony, we were able to get it open, thanks to Mikal and AAA. We topped the weekend off with a dinner at the Icon Grill. All of the ceremonies seem to melt together in my mind; but each one was special in its own way. Wow! That is a lot of graduations in three days! Congratulations to all the grads!